February 7, 2019, peacefully at hospital, beloved husband of Yvonne, Birch Green, Dunmurry, dear father of Stephanie and Richard, father-in-law of Jackson and Wendy, grandfather of James, Janette, Clare, Carly, Mark and partner Gerard also great-grandfather of Brandon. A Service of Thanksgiving for Roy’s life will be held in St. Hilda’s Parish Church, Seymour Hill, on Monday 11th February at 12.00 noon and thereafter to Lisburn New Cemetery Extension (arriving at 2.00 p.m). Family flowers only please. 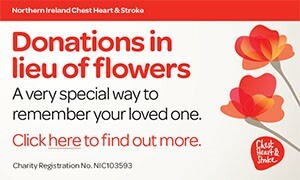 Donations made payable, to Northern Ireland Chest, Heart & Stroke may be sent c/o Elwood & Capper Ltd. Independent Funeral Directors, 238 Kingsway, Dunmurry, BT17 9AE. I am sorry to tell you that Rodger (Roy) DODDS has passed away.